Dave Feldman (Bethesda Green), Steve Nash (MOM's Organic Market), Dr. Stewart Edelstein (The Universities at Shady Grove), Noah Katz, Dan Dozier (Little Falls Watershed Alliance), David Lublin (Town of Chevy Chase), Rabbi Fred Dobb, Steve Hull (Bethesda Magazine), and Joseph Chirico (Capital One Bank) at the Oct. 7 Gala. If you attended the Bethesda Green Gala back on October 7, then you saw the seven winners of the first-ever Bethesda Magazine Green Awards—and heard their acceptance speeches, too. We’ve published a recap of Bethesda Green Gala highlights, with a link to photos from the event. Bethesda Green’s First Thursday Happy Hours are always a great evening. 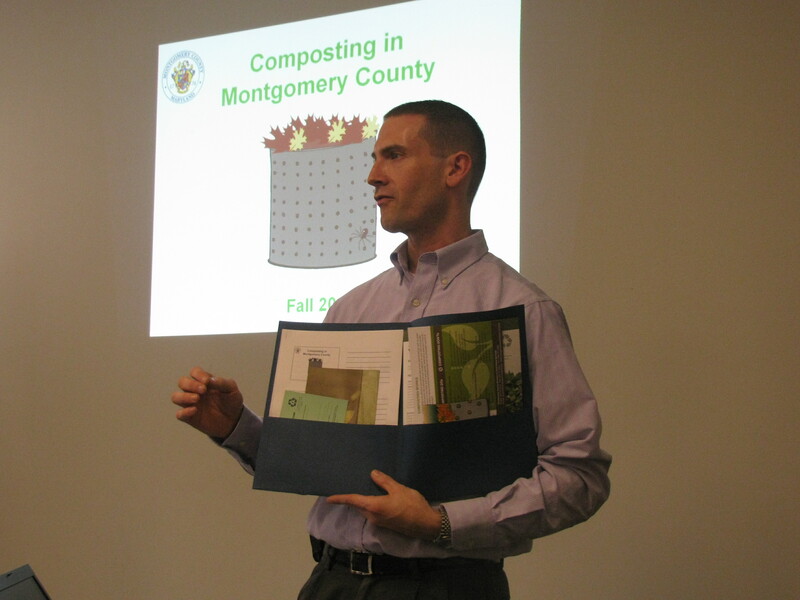 A chance to meet others committed to green living in Montgomery County, catch up on news and connections, and learn something new from the invited guests and speakers. Held at local restaurants, bars and hotels, it’s also a chance to check out new places and chef’s specialties. First Thursdays are always full of activity. The noise level is high, some people stay for a long time while others drop in and out as they make their rounds, and the group gets larger and larger each month. It’s a friendly atmosphere, and nametags help you get to know people on a first-name basis. 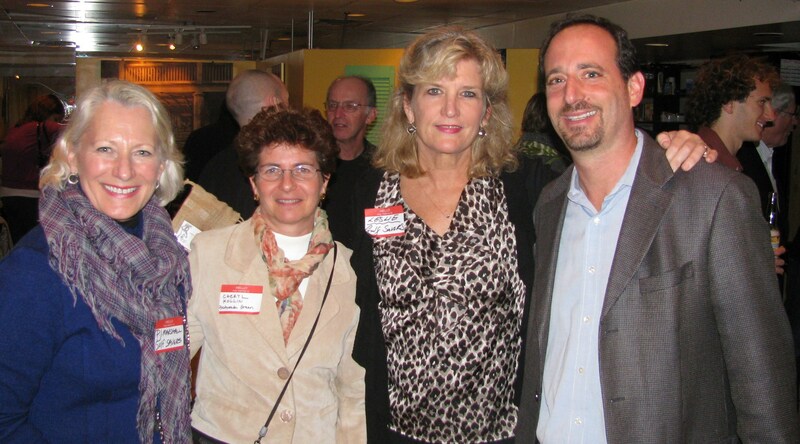 PJ Marshall (Gulf Savers), Cheryl Kollin (Bethesda Green), Leslie Carrere (Gulf Savers) and Dave Feldman (Bethesda Green) at Louisiana Kitchen. This past Thursday the gathering place for the First Thursday Happy Hour was Louisiana Kitchen at 4907 Cordell Avenue, selected because the evening focused on two nonprofits committed to restoration efforts in the Gulf of Mexico. Those who attended gave $10 at the door to benefit Gulf Savers, a reforestation effort that is restoring Gulf marshlands and Voice of the Wetlands, dedicated to increasing awareness about the loss of wetlands in southern Louisiana. Both causes underscore the impact of the Gulf oil disaster on local wildlife and ongoing efforts toward restoration. As part of the spirit of the evening, Louisiana Kitchen served a generous buffet of Chicken Etouffee served over Rice, Andouille Sausage with mustard, and Catfish Beignets with Remoulade Sauce. The tasty, hot and spicy food went perfectly with drinks from the bar, lively conversation and an evening dedicated to the Gulf of Mexico. Representatives from Gulf Savers and Global Green USA spoke about efforts to restore the marshlands that are so important to the ecosystem of the Gulf of Mexico. “I was excited to hear the speaker. The reforestation project in the marshlands is very impressive,” said Petya Balevska, a Bethesda-based financial planner and first-time attendee at First Thursday Happy Hour. Petya went on to say she’s looking forward to the next Happy Hour. “Being here gives me a sense of community that I don’t usually find at small, local non-profits. The people here are genuinely into the green movement. It’s a very positive group,” said Petya. From the size of the crowd still at Louisiana Kitchen as the event ended at 8 pm there are many others who agree. First Thursday Happy Hours are held on the first Thursday of each month. The next Happy Hour, scheduled December 2, will take place at Redwood Restaurant, 7121 Bethesda Lane (the Bethesda Row Pedestrian Lane). Fund raised will be shared with Greater Washington Interfaith Power & Light, which helps congregations go green by minimizing their environmental impact. For more information about upcoming Happy Hours, including highlights from previous events, see the Bethesda Green page on Meetup. In late October, Chevrolet’s Volt Unplugged tour stopped outside Redwood in Bethesda Lane. Clean-car fans know the Volt is Chevy’s new electric car, which goes into production soon and will be available in seven markets—including D.C.—in early 2011. The Volt is expected to go between 25 and 50 miles on one battery charge, after which a gasoline engine (with 9-gallon gas tank) will take over.